Vard has announced that Farstad Shipping ASA (Farstad) diesel electric Platform Supply Vessel (PSV) Far Sun, is set to receive "significant savings" from VARD's SeaQ Energy Storage System. Vard says the vessel, which is on long-term charter with Statoil ASA (Statoil), will see reductions in fuel consumption and emissions once retrofitted with batteries for energy storage. "We are impressed by the strong focus Farstad Shipping has on safety and environmentally friendly operation of its fleet, as well as education of crews to ensure safe and efficient utilisation of new technology. Having worked closely with Farstad through this project, we are convinced that the SeaQ Energy Storage System will provide significant savings for Farstad and Statoil over time," said Christian Søvik, VP Global Services of Vard Electro. The SeaQ Energy Storage System is set to be installed during the second half of 2017, with Vard Electro responsible for the entire project, including engineering, steel prefabrication, installation, integration, testing, and commissioning. "The system enables the ship to utilise excess energy in all operating conditions, as well as simplifying the use of shore power. This will substantially reduce consumption and emissions. Another effect is less noise from ships in port." "Farstad Shipping has always focused on new technology for more efficient and safe operation with a minimum of environmental impact from its operations. The upgrade of Far Sun incorporates the range of measures in this regard," said Børge Nakken, VP Technology and Development of Farstad Shipping. 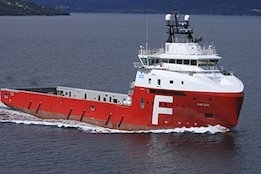 Following the retrofit, the ship is expected to be awarded class notation "Battery Power" from DNV-GL. Last year, Ship & Bunker reported that a joint development project (JDP), run by DNV GL, Farstad, and Statoil, demonstrated a potential annual €21,000 ($23,548) energy savings from the DNV GL's trim optimisation tool, ECO Assistant on two platform supply vessels (PSV), including the Far Sun.